The country remains committed to the U.S.-led order, but finds itself in uncharted territory. The recent U.S. midterm elections attracted what was surely unprecedented global attention. There has been a sense around the world that the United States has become the epicenter of unpredictability. The elections last month being a prelude to the 2020 presidential election, observers nervously tried to dissect the American political climate. Yet it is doubtful that the midterm elections will have a significant impact on the course of American foreign policy. After all, they were not contested on the basis of major foreign policy issues, although trade and immigration, most notably the “caravan,” was a popular theme at rallies attended by President Donald J. Trump. In early October, U.S. Vice President Mike Pence came out strongly against China in a tough speech delivered at the Hudson Institute. On the same day, Larry Kudlow, Director of the National Economic Council, told an audience at the Economic Club in Washington, D.C. that the formation of a “trade coalition of the willing to confront China” was needed. A few days after the election, Peter Navarro, Director of the Office of Trade and Manufacturing Policy, delivered a speech condemning China for “intellectual theft” and taking advantage of the openness of American society. Many of the concerns expressed in these remarks are shared in Asia, particularly in Japan, where the worry is that the possible emergence of a “China-centric order” in the region would undermine the conditions – a liberal, open, and rule-based order – that have made the region prosperous. As a beneficiary, Japan has a large stake in preserving that order and has never been shy about stating that position. However, it cannot hold this position alone. Japan needs to make a concerted effort with partners and allies in the region, most notably the United States. Ideally, China would also become a partner in this effort, although that vision is becoming more precarious with every day. 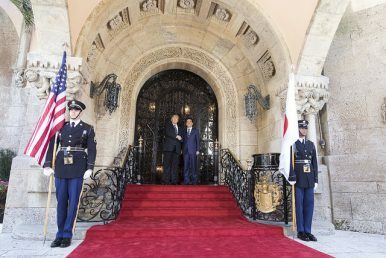 The recent visit by Prime Minister Shinzo Abe to China is sometimes portrayed as Japan hedging as a result of loss in confidence in the United States. This is not true; Tokyo’s efforts to mend relations with Beijing have been continuous and pre-date the Trump administration. Moreover, Japan-Sino relations have been so contentious over the past seven to eight years that what Japan seeks at this moment is very modest: less contentious relations, rather than an amicable relationship. However, this does not mean Japan is not worried. In fact, it is worried about the American commitment to the region and its willingness to remain a resident power. I am not just talking about current U.S. foreign policy. Both camps may well dispute this, but there is a thread that connects the foreign policy of former U.S. President Barack Obama with that of President Trump. If we distill the essence of Obama’s foreign policy, we can discern three aspects: ask allies and partners to do more; stay away from ambitious interventions; and focus on nation-building at home. These are the same pillars of Trump’s foreign policy. Yes, I am trying to be provocative and am perhaps exaggerating a bit. There are important differences between the two administrations. You could say that Obama was a “smart retrencher” who understood the negative effects of American retrenchment and did his utmost to minimize the damage. Obama tried to supplant American retrenchment with multilateral arrangements, whereas Trump is a “blunt retrencher,” a unilateralist with complete distrust of multilateral institutions. Trump’s notion of non-intervention is rooted in his sense of nationalism. Whereas Obama’s notion of nation-building at home was epitomized by Obamacare, Trump’s tilts more towards preventing unwanted elements entering the country; hence, the wall. Yes, these are important differences, but both are retrenchers nonetheless. Certainly, Trump’s erratic behavior and statements are of grave concern. But what worries us even more is the continuity between these two very different presidents. If there is a continuing thread between the two administrations, it may suggest that the American predicament is structural, and that is something with the potential to alter the geopolitical landscape. It is difficult to discern from the results of the midterm elections where the United States stands in terms of global commitments. Midterm elections are usually not about world affairs anyway. The reason why the world was so preoccupied with them this year was that there is an unprecedented craving to understand where the United States is going. People are searching for clues to understand America. The reality is that no one knows what direction the U.S. is taking, and that applies to Americans as well. We are in uncharted territory. The United States has traditionally been a constant in world affairs, but that constant is no more. The midterm elections gave us no really clues as to what might happen next. The Democrats did push back, but at the same time, the United States did not completely reject President Trump. The election showed there are pathways for his reelection. Even if he loses, what if Democrats choose a blunt liberal retrencher? We should be prepared for two more years of this bumpy ride, but if it continues beyond 2020, then it may be time for hedging. Toshihiro Nakayama is professor at Keio University and Japan Fellow at the Woodrow Wilson Center.